You know how it goes, every year when Black Friday rolls around you're searching for deals until midnight. You get some absolute bargains, but there's only so many hours in the day; missing out on some big savings by a few hours is rough. With that in mind, we thought we'd make things a bit simpler by starting our Black Friday sale right now! 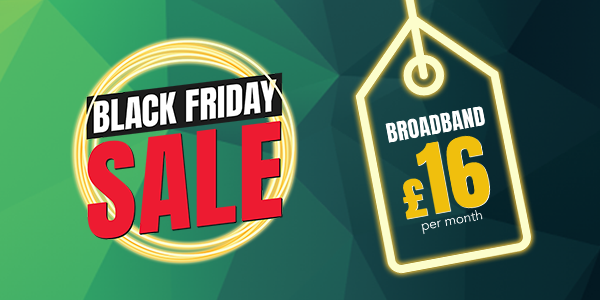 Origin Broadband, with an average download speed of 11mbps, is available at a special rate of £16.00 per month over 12 months. Origin Fibre, with an average download speed of 35mbps, is available at a special rate of £23.00 per month over 18 months. Origin Max, with an average download speed of 63mbps, is available at a special rate of £25.00 per month over 18 months. If you're up for one of these fantastic deals, get over to our website before they're gone on the 3rd of December. If you'll be browsing for a bargain this Black Friday, look out for our top picks of Black Friday bargains on the day itself; the 23rd of November. Happy hunting!